The cold weather and strong head winds this year were nothing compared to last year’s Hurricane Sandy that forced NYRR to cancel the NYC Marathon. 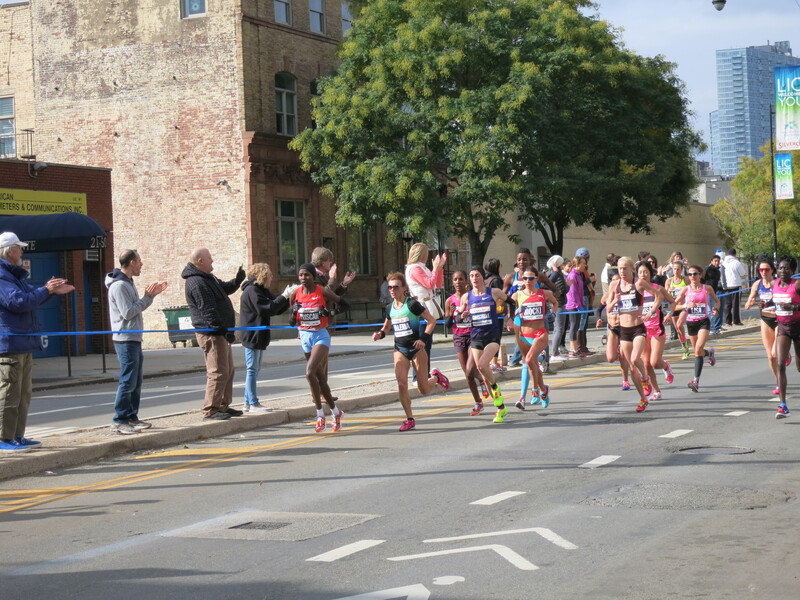 The return of the marathon was rejoiced by runners and fans (while non-fans sulked and stayed away from the route). Ben and I spectated in Long Island City, Queens (near 23rd St. & 44th Dr between Miles 14 and 15) with our friends. It was very exciting and fun cheering for the runners, especially since we knew so many people running in the marathon. We arrived just before 10:30, minutes before the elite women ran by. We saw a few of the wheelchair competitors go by as well. Ben crossed the street before I did. We ended up watching the elite women from different sides of the street. Then I finally crossed the street and we set up our little spot. Originally Ben thought I was being a little ridiculous by insisting that we bring portable camp chairs and a blanket to the viewing party. I regret nothing. After standing for more than a couple of ours, I was happy to have a chair to sit in. At times the wind was so strong that it was quite cold, especially when the sun was hidden by clouds. The blanket provided much needed extra warmth and insulation. Ben gratefully huddled with me under the blanket while we cheered for the runners. Next the elite men ran by us. We screamed with excitement when we saw Meb Keflezighi. He didn’t have the best day on Sunday, but he finished with class and gave this emotional and heart touching interview. I didn’t know much about him before Sunday, but that interview turned me into a superfan immediately. How can you not admire and respect a guy like this? Now we settled into the long wait for our friends. We had a long list of people for whom we were waiting. This made it fun because it meant that every 15 minutes or so we had another person that we were anxiously looking for in order to cheer, hug, and encourage them on to the finish line. After the elites ran past us, a slow trickle of runners came by. Then the trickle became a flow. Then it was a strong stream of runners without a beginning or an end. It was interesting to see how at certain points the crowd got a bit denser, thinned out a bit, and then it got denser again. Several miles later we could still see the effect that wave starts has on runner density. 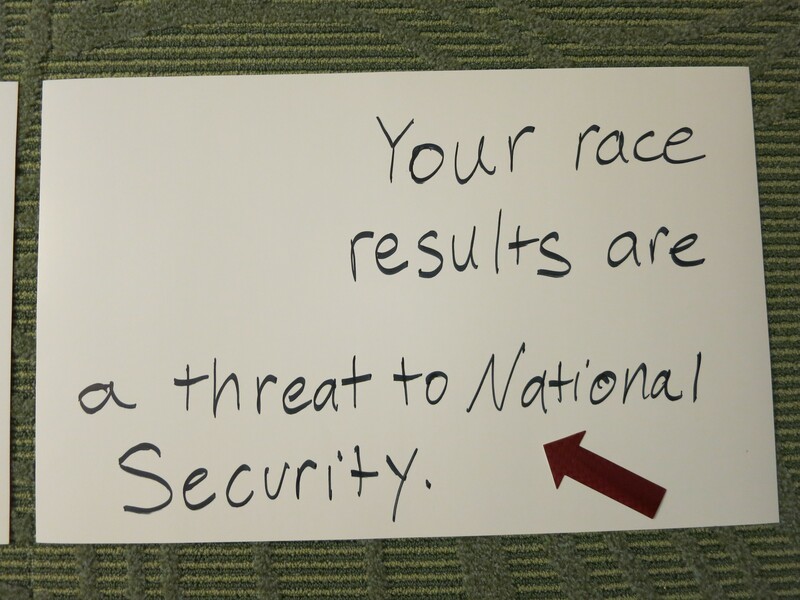 I loved watching runners read our signs and then getting it. They would either crack up laughing or signal their approval by smiling or flashing a thumbs up sign. One of the runners even stopped to take a picture. That totally made my day. I also LOVE CHEERING FOR THE BACK-OF-THE-PACKERS!!!!!!!!! They are way more fun than the more serious runners. We yelled out their names and they waved or nodded their heads in appreciation. Many of them went out of their way to run to the sidelines to participate in the wall of high fives. A bunch of us lined up and held out our hands to give high fives to runners. And one by one runners ran by us slapping our hands together to give a high five. So many of them came up to us to thank us for sticking around to cheer. They really loved having us and we loved cheering for them. 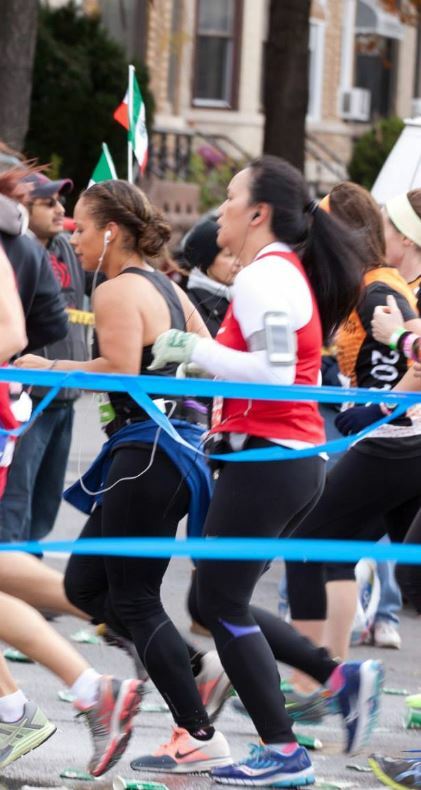 I was worried about missing one of my really close friends running her first marathon, but luckily she caught a sight of me and ran over. I hugged her briefly and wished her good luck. Like that, I watched her disappear into the crowd. We found most of our friends who were running. It was quite inspirational watching everyone. It almost made me wish that I was doing a marathon. Almost. Not quite. After we saw our friends go by, our group decided (by our group, I mean me. I went around to everyone and asked, “Don’t you want Korean food?” Best trick to getting what you want in life without appearing like an overbearing bully.) to go to Shilla, a Korean restaurant in Koreatown in Manhattan for some hot soup to warm up. After several hours of standing and yelling in the cold, we were tired and hungry. We devoured our food and then made our way home. I hadn’t realized how exhausting spectating and cheering were. Then we got home, I made myself a cup of hot chocolate, which I drank and then I promptly fell asleep for several hours on the couch. I loved the spectacle and pageantry that is a world class marathon. My friend who completed her first marathon beat her expectations and ran faster than she had anticipated. She told me that crossing the finish line had been an emotional experience because she completed something that she thought wasn’t possible. She was overwhelmed and cried. Then she asked when I was going to do one. It’s not the right time in my life to train for a marathon now, but I’m making plans for one in 2015. Til then, I’ll keep doing the shorter races. Here’s a few inspirational stories of the NYC Marathon below. Thanks for coming out! The spectators are what made this event so memorable. That, and these awesome blisters. Those won’t be going away anytime soon either. It was super fun. I feel that as a runner I gained greater appreciation for all the spectators by doing this. Sounds like a fun day out there! I spent the early morning at the start and most of the day at the finish. I LOVE seeing the mid-packers and back-of-packers finishing too. So many happy faces, fist pumps, hugs. It was really inspiring to see. Meb has such an amazing spirit. I’ve interviewed him a few times. 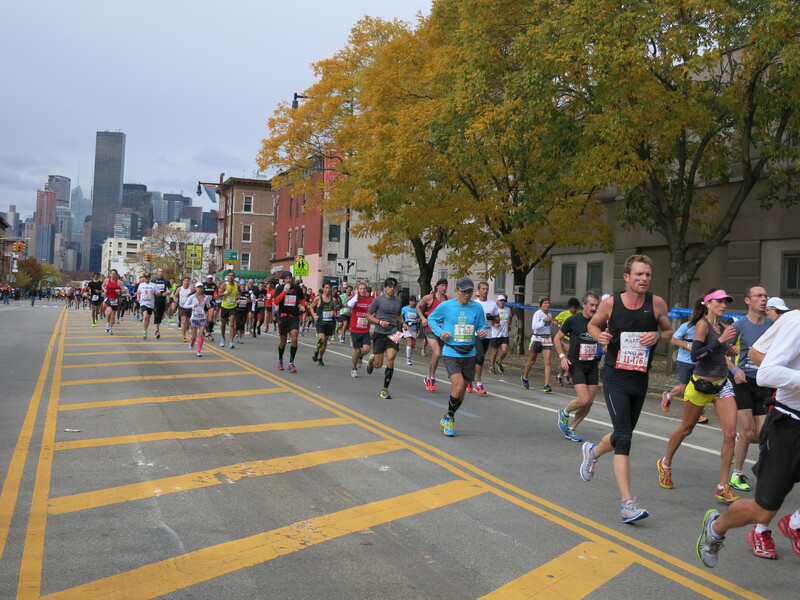 Check out the On The Run race recap of the marathon. Meb crossed the finish line hand-in-hand with local NY runner, Michael Cassidy. They ran the last few miles together. It was really touching. You had a busy day last Sunday! Some of the people you interviewed looked soooo cold. Very cool! 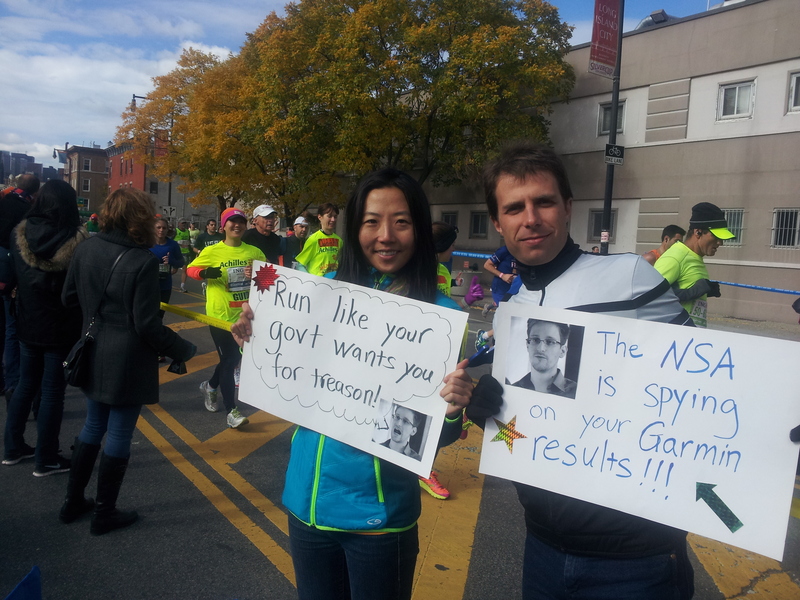 I love funny race signs. And I know what you mean about the slower runners being more inspiring at times – after I finished the Disney marathon this past year, I went looking for a friend who was walking due to injury. We ended up staying and cheering until the very last runner finished. It was great seeing their determination! I loved being a part of their experience by cheering for them. They really appreciated hearing their names being called out. I know that not everyone has someone waiting to see them on the sidelines, so I hope that we managed to make someone’s day by personally cheering for them. We were probably right next to each other! I looked at your post. Yes, we were quite close to each other. 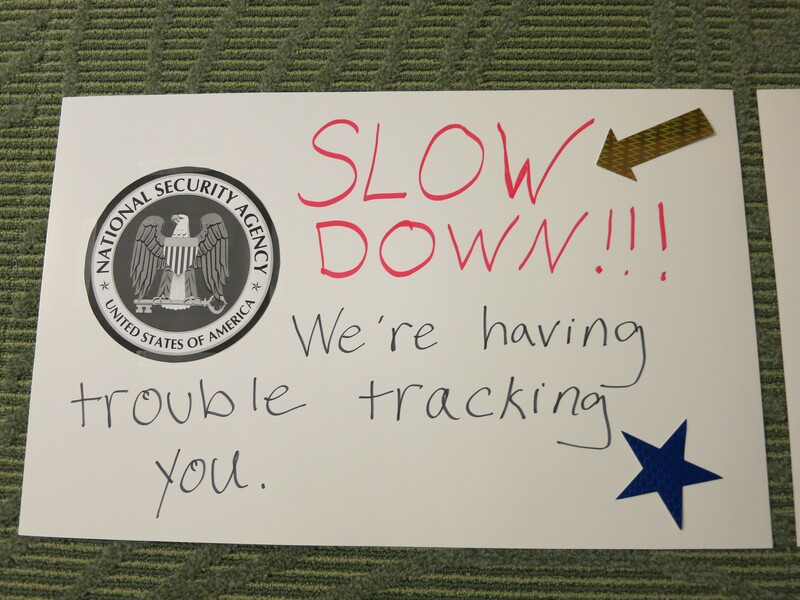 Your signs are awesome. I would have cracked up when I saw them. I spectated at NYC a couple of years ago when my husband ran it and it was so amazing to be in the midst of all of thousands of people all psyched to watch thousands of other people run. There’s really something special about the big city marathons. I can’t wait to run in one of them. Thanks. It made me so happy when the runners laughed. My bf has ran in a few marathons and he says there’s nothing like the crowds in NY.